Apart from the heritage buildings and beautiful architecture, the multicultural living heritage of George Town also significantly contributes to the diversity of this historic city. As a trading port, George Town attracted traders from Sumatera, the Malay Peninsula, India and China. People from various cultural backgrounds settled in George Town, creating a mosaic of multicultural communities. The George Town UNESCO World Heritage Site still has a large number of people residing in the core and buffer zones. The different communities such as the Malays, Chinese, Indians, Straits Chinese (Baba Nyonya), Jawi Peranakan, Arab-Malays, and Eurasians are present here, with each community practising their customs, cultural practices and religious beliefs, making the World Heritage Site a vibrant living multicultural heritage town. Also known as living heritage or living culture, intangible cultural heritage refers to the practices, representations, expressions, knowledge and skills handed down from generation to generation. Intangible cultural heritage is created, maintained, and transmitted within communities, and we need to recognise and promote the importance of cultural heritage of the George Town UNESCO World Heritage Site, which is an important link to the authenticity and integrity of its Outstanding Universal Values. Conservation of living cultural heritage requires the participation of people for whom cultural assets have special associations and meaning, or who have social, spiritual or other cultural responsibilities for the cultural assets. George Town World Heritage Incorporated undertakes inventory on cultural assets and facilitates mapping of intangible cultural heritage, as well as conducts capacity building workshops to enhance the community’s knowledge on safeguarding their intangible cultural heritage. 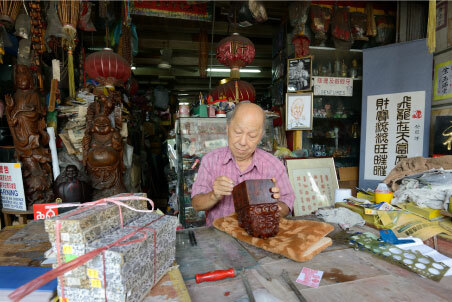 An intangible cultural heritage inventory was initiated in 2012 to identify and document the traditional trades, craftspeople and cultural practitioners in George Town. The project comprised door-to-door surveys of over 5,000 premises, followed by a sample of 20 case studies for in-depth documentation and preliminary identification of threats to their sustainability. In 2019, a community-based intangible cultural heritage inventorying initiative is carried out with local community participation to inventorise the rituals and festive events of George Town. It is a pilot project in collaboration with UNESCO. coexistence of the different faiths in George Town. Through this meaningful celebration every year, the local communities share their culture and traditions to thousands of celebration-goers, who come from near and far to experience the diversity of George Town. It is also a rare experience for these visitors who have the opportunity to immerse in our local customs and traditions. With the involvement of the local community and hundreds of volunteers, the Celebrations is significant in that it raises awareness on the importance of conserving the intangible cultural heritage of George Town. See George Town Heritage Celebrations. The real heroes behind the city’s intangible cultural heritage, the traders and craftsmen have over the decades perfected their trades and crafts, faithfully serving the local communities and tourists in George Town. To document their working lives, George Town World Heritage Incorporated conducted a project from 2015 to 2017 to film the daily life, working methods and environments of 15 artisans and practitioners in George Town. The project’s outcome was in the form of videos produced by Image Farm Productions, and were screened to the public at Majestic Theatre on 1 April 2018. Those featured in the video documentaries were watch repairers, electroplaters, optometrists, canvas and leather goods maker, rattan crafters, trishaw maker, joss stick makers, tailor, mahjong makers, shoemakers, songkok maker, goldsmiths, dhobis, Chinese physician and Al-Quran publisher. The videos are available at the George Town World Heritage Incorporated Interpretative Centre. People have stories and experiences, especially those who have seen George Town’s hustle and bustle back in the olden days. 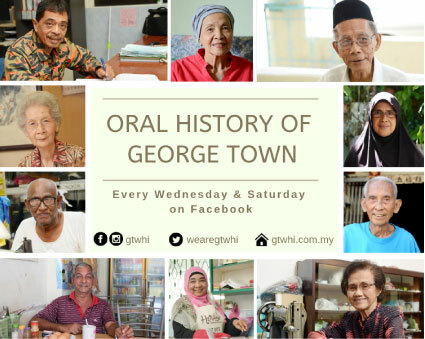 Since oral history is viewed as a powerful tool to discover untold memories and stories of the past, and also to safeguard our heritage, George Town World Heritage Incorporated initiated the Oral History Documentation project in 2013 to collect the stories of ordinary people in George Town. The project aimed to improve the process of research and recording history, train future documenters, and expand the resources at our Resource Centre. Preliminary trainings were conducted in collaboration with National Archives of Singapore. Chulia Street was selected as the location to record the recollections of residents during the pilot phase of the project, focusing on their memories living on the street in the post-war period of 1945-1970. Over 100 stories have been recorded in four years, from 2013 to 2016. The audio recordings are available to the public at the George Town World Heritage Incorporated Interpretative Centre.